← Make your own animated chat-pictures! 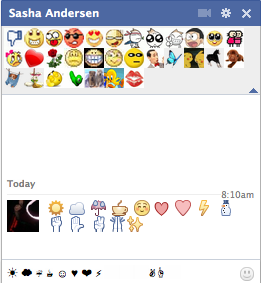 Benny Livistonia found a bunch of hidden facebook-smileys! This entry was posted in Chat Codes and tagged benny.livistonia, chat, chrome, code, codes, emoticons, facebook, firefox, google, google chrome, hidden, pictures, smiley, smileys. Bookmark the permalink. 7 Responses to Hidden facebook smileys!